The Babes Ride Out Artist series showcases the art of talented people in our community. Each piece is donated to the Moto F.A.M. X Babes Ride Out raffle. Moto F.A.M. is a nonprofit organization dedicated to helping riders facing life changing injuries after a serious motorcycle accident. Meet Stefanie Klempau @fabricstattoo! 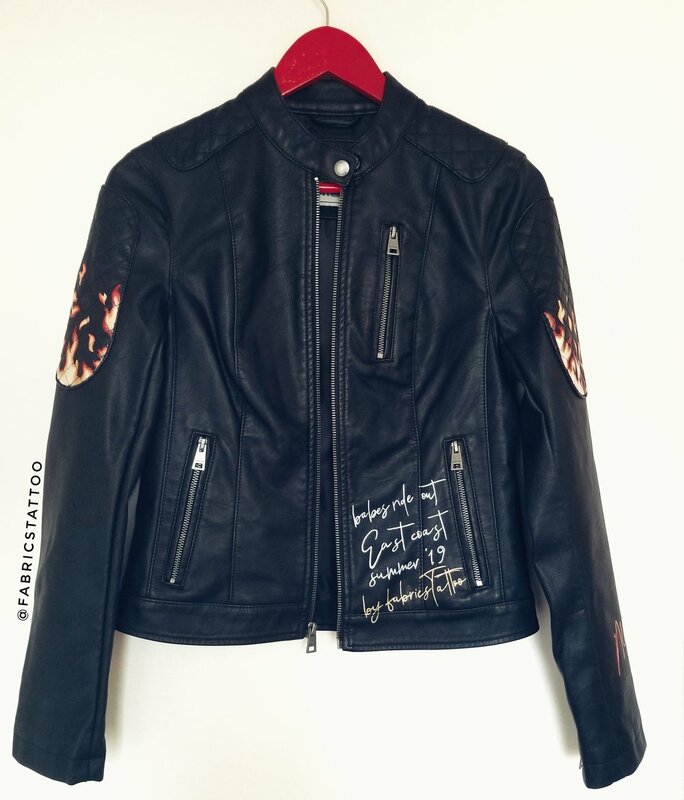 She has hand painted this gorgeous Vegan Leather size small levis jacket for BRO East Coast 4 raffle. Read on to get to know more about Stephanie and her craft! Now I live in Chile, South America where my parents grew up. What first got you into art? My mom was a great artist, and my sisters also painted a lot when they were little. There were a lot of drawing books at home and my mom helped me. My style is very perfectionist and realistic. I love color harmony, nothing to bright. Designs that blend perfectly with the environment. I think I got that from my mom too: stand out, but not too much. Always subtle. What inspires you? Have any artists in particular been an influence on you? When I was a teen I was very into Dali. I loved his fantasy designs, but with realistic drawing at the same time. I copied a lot of his work with pencil. But in general, I feel very inspired by nature. Nature is always balanced, harmonic and elegant. My favorite medium is the good old simple pencil: 2B. Simple black and white drawing. I have never been a fan of colors before I started painting on leather jackets. That was my biggest challenge. Actually, I wanted to do only white illustrations on black faux leather but I'm thankful that my customers made me use colors cause now I’m not afraid anymore. Color technique is not something easy when you have never taken a course of any kind. When did you first hear about Babes Ride Out? That was when I visited Los Angeles in February 2019 to meet a photographer who was into motorcycles. She saw my jackets and said I totally had to make something for this amazing show. What is your connection to the motorcycle community? Jackets. The cool, amazing jackets with fun designs, that moto cyclers use. If you were a motorcycle what kind would you be? I would be a Cafe Racer, because I feel that my jackets would fit in perfectly in the concept. What will you be contributing to this years raffle? 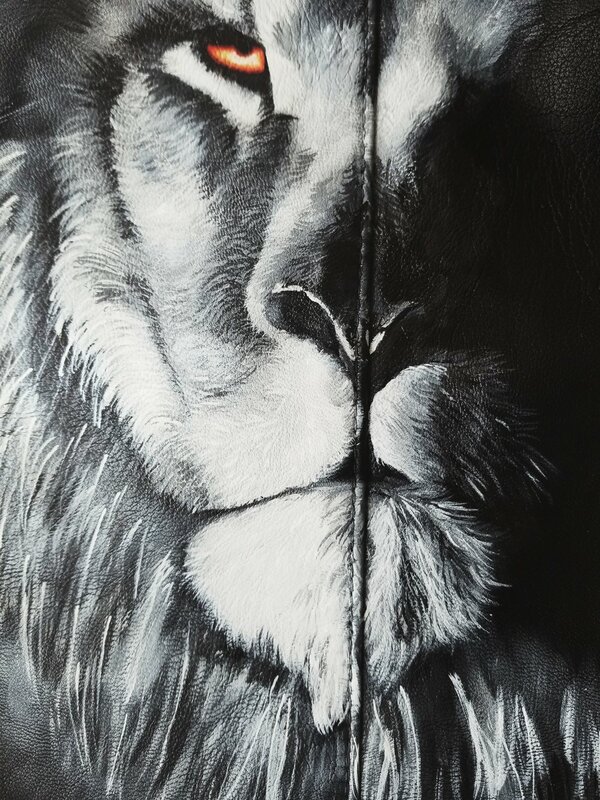 I will contribute a custom hand painted jacket. Tell us about what inspired you to create it? I have been watching a lot of images and documentaries about motorcycles lately and I have so many ideas for the concept of women empowerment on a motorcycle. And in addition, your “camping” concept is even more inspiring. It's like “motorcycling under the stars”. Absolute and pure freedom.